U.S. stock investors are wary that a 30 percent slump in oil prices will pressure corporate profits while also presenting a sign of weakness in global growth at a time they are already weighing when the long economic expansion will end. 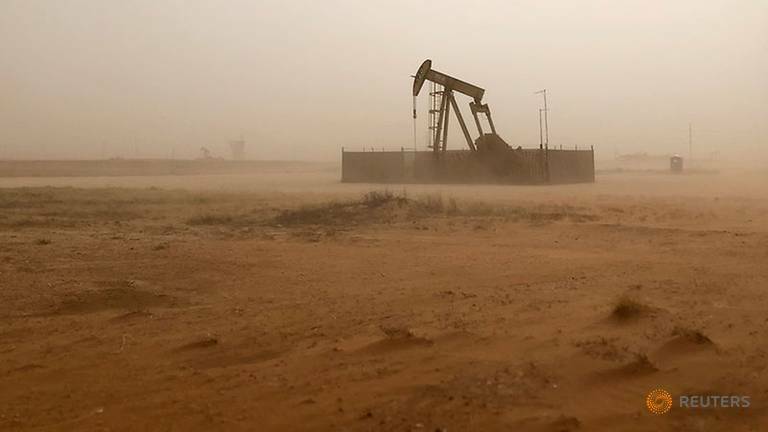 Crude prices rebounded off of one-year lows to start the week, with investors focused on Thursday's meeting in Vienna of the Organization of the Petroleum Exporting Countries (OPEC) and allied producing countries including Russia. A monitoring committee of OPEC and its allies agreed on the need to cut oil output in 2019, two sources familiar with the discussions said. Oil's drop holds economic benefits, including lower costs for some companies and cheaper fuel prices for consumers. But investors were already bracing for a significant drop in U.S. profit growth next year, and the oil price slump is poised to bite into profits for energy producers and related companies that are part of Wall Street's benchmark S&P 500 stock index . OPEC and allied producers used output cuts to curb an oil glut that sent prices from late 2014 into a prolonged slump, bringing prices to below US$30 a barrel at the start of 2016. But supplies are growing again, and the U.S.-China trade war and other factors have investors worried that slowing economic growth could erase demand and send prices still lower. Crude oil prices have fallen 30 percent or more 13 times since 1982, according to Ed Clissold, chief U.S. strategist at Ned Davis Research. Of the prior 12 occurrences, the oil drop overlapped eight times with what Ned Davis Research defines as a cyclical bear market - a 30 percent drop in the Dow Jones Industrial Average after 50 calendar days or a 13 percent decline after 145 calendar days. Futures contracts for U.S. crude , known as West Texas Intermediate (WTI), topped US$75 a barrel in early October. The commodity slid to as low as US$49.41 last week, but has clawed back since and is now trading around US$53. Brent , the global crude benchmark, has notched a similar percentage drop. “Somewhere in the US$50-60 level, it’s probably a good level for the market, because producers are making enough money and it’s also helping the consumer," said Keith Lerner, chief market strategist at SunTrust Advisory Services in Atlanta. "But if you see an abrupt move down, the bigger concern is what is that signaling about the global economy." 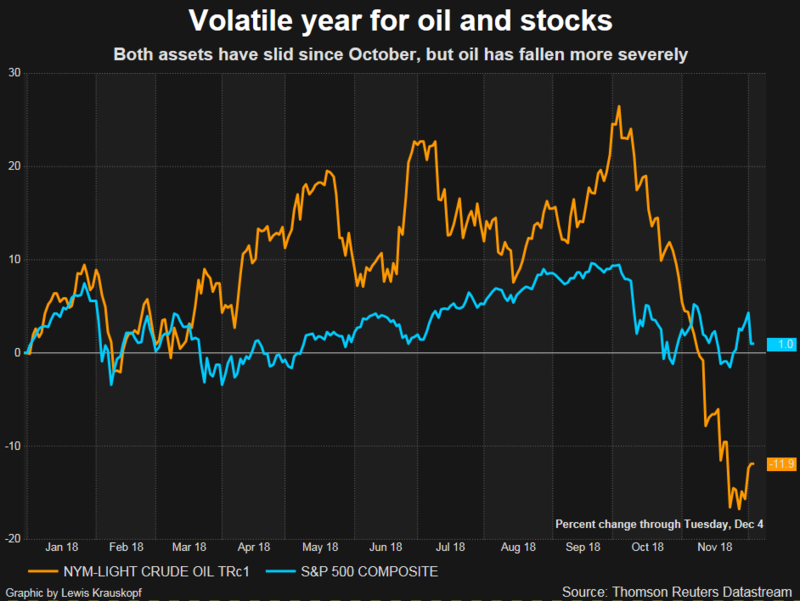 Oil's decline has coincided with increased turbulence in the stock market. The benchmark S&P 500 late last month confirmed a correction, a decline of more than 10 percent from its all-time high. Still, investor optimism about a less aggressive path of U.S. interest-rate hikes prompted a modest market rebound. Since oil's October peak, the S&P 500 energy sector has dropped 16 percent, about twice the drop for the overall S&P 500. Analysts have been lowering earnings estimates for the sector, with S&P 500 energy companies now expected to increase earnings by 21.3 percent in 2019, down from an expectation of 26.2 percent on Oct 1, according to IBES data from Refinitiv. Many investor see positives in the oil drop, including a potential stimulus for consumer spending through lower gasoline prices. Lower fuel prices could help check inflation, allowing the Federal Reserve to slow its program of U.S. interest rate hikes. But David Bianco, Americas chief investment officer for DWS, estimates that every US$5 per barrel decline in oil prices shaves US$1 to US$1.50 per share from S&P 500 earnings. The S&P 500 is expected to earn US$162.81 per share this year, according to IBES data from Refinitiv.